Why Buy a Porsche Panamera Hybrid? Before, the electric engine was more of a booster. It needed 80 percent of the throttle to engage it. That felt good, offering you an extra jolt of power at speed. Yet that extra power should always be available to you. Thus, the new hybrid powertrain combines a 300 hp twin-turbo V6 with a 136 hp electric motor. The result is an aggressive 516 lb-ft. of torque. Not only this, but running on the electric engine alone can save you gas. The range without even using the gas engine is 31 miles. That makes it remarkably easy to use the car for local errands or even daily commutes without burning a drop of gas. The ability to recharge the battery quickly (or even while driving) means that you can rely on the quiet electric engine alone for a number of daily tasks throughout your entire week. Yet when you want to jet down the highway with that Porsche roar in your ears, maybe with the music blasting, the extra power of the electric motor always being available to you makes the Porsche Panamera hybrid an exceptionally powerful beast. Performance is superior, and the hybrid powertrain is balanced very near 50:50 to aid that incomparable Porsche handling. Luxury is still delivered just as you expect from Porsche, with an incredibly exquisite and detailed interior built around driver comfort. 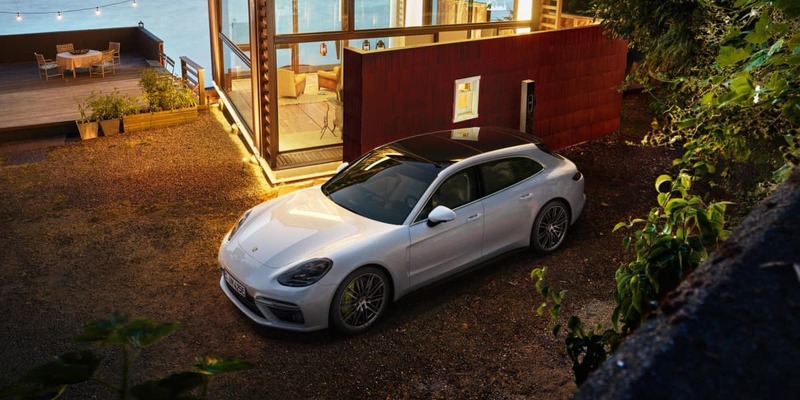 The Porsche Panamera hybrid alone is reason to say, “Find a Porsche dealership near me.” The future of hybrids is here, and it’s every bit as powerful and dynamic as the technology has long promised. 0 comment(s) so far on Why Buy a Porsche Panamera Hybrid?